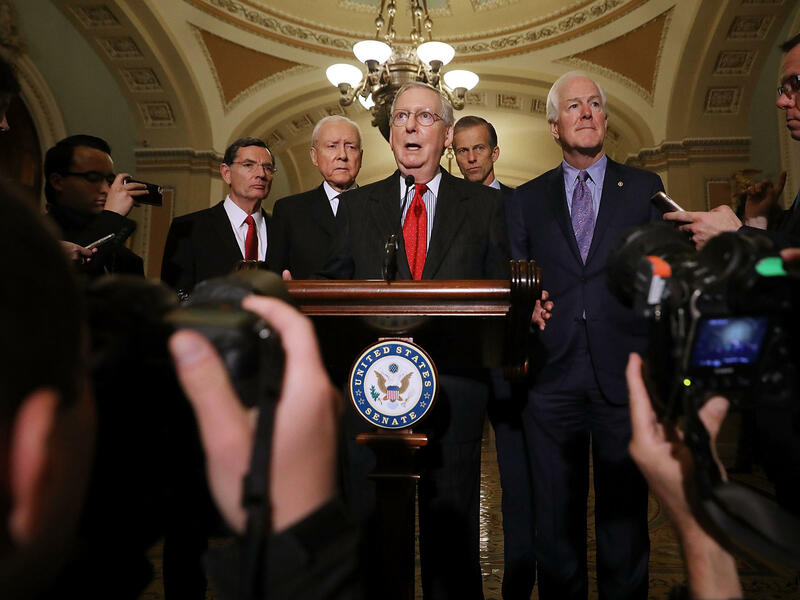 Republican Senate leaders, shown here speaking to reporters after the Republican Policy Committee luncheon at the Capitol Wednesday, are finalizing details of a tax plan they hope to vote on this week. Republicans are struggling with a way to cut taxes without increasing the federal budget deficit, and one idea under consideration would be a budget trigger. However, it's already generating lots of opposition. NPR's Jim Zarroli reports. BOB CORKER: To try to create a backstop or a trigger mechanism that, to the extent the growth estimates that have been laid out aren't achieved, we don't pass on even greater debt to our children. ZARROLI: Corker didn't provide details, but the idea is this. If growth is less than expected and tax revenues fall short, Congress would undo the tax cuts. It would raise corporate taxes by as much as $350 billion according to Bloomberg News. Larry Summers calls the idea absurd. LARRY SUMMERS: This kind of gimmick is the reason why Congress has single-digit popularity ratings. ZARROLI: Summers says the imposition of a trigger means that Congress would have to raise taxes at a time when the economy is underperforming, maybe even in a recession. And that's exactly the wrong time to do it. SUMMERS: You'll deliver the economy a body blow, reducing consumption and reducing investment just at the moment you most need to be encouraging. ZARROLI: Summers also believes Congress would never really allow a tax increase to go through in the midst of a recession. The political pressure to override the trigger would be too great. The idea is also unpopular on the right. Business and conservative groups lined up against the proposal today, including the U.S. Chamber of Commerce and the Koch brothers-funded Americans for Prosperity. Romina Boccia of The Heritage Foundation says businesses need certainty. The prospect that a tax increase might kick in if growth slows would make a lot of them more cautious about the future. ROMINA BOCCIA: Including a potential tax increase through a trigger or by any other means creates uncertainty, which will lower the overall economic growth we can expect to see from the tax plan. ZARROLI: Whether the trigger will actually make it into the final tax bill is unclear. Several Republican senators are already expressing doubts about the idea. And Louisiana Senator John Kennedy was quoted as saying he would rather drink weed killer than support a trigger. But Republicans are searching for a way to cut taxes without increasing the deficit, and this is one way they hope to accomplish that. Jim Zarroli, NPR News, New York. Transcript provided by NPR, Copyright NPR.